AVALON — Another option for a cruise ship pier in Avalon has been proposed, and this one includes an airport and a marina. With Catalina Island Chamber of Commerce president Wayne Griffin already presenting three pier expansion options to Avalon city council members in October 2011, a fourth option proposed by Island Enterprises owner Jeff Stickler has been unveiled this year, bringing a whole new realm of possibilities to the table. The three original proposals all include a dock extension off of Avalon Harbor’s Cabrillo Mole, but Stickler’s option proposes an alternative cruise ship terminal east of Cabrillo Mole that would be capable of berthing multiple cruise ships. It would also add a 4,500-foot-long landing strip for a commercial airline and a new marina with a fuel dock and a boatyard. “We’ve got the rock to build the land, and we’ve got the property: I don’t see any downside to it,” Stickler said. The project proposals were prompted by a need for Catalina to expand its limited amenities for visiting cruise ships, as the cruise ship industry moves away from tender-dependent destinations. Currently, cruise liners such as Carnival’s 2,052-passenger Inspiration — which makes Catalina a regular stop on its four- and five-day cruises from Los Angeles to Ensenada, Mexico — have to anchor offshore and rely on tenders to ferry passengers to and from the island. Last year’s Cruise Ship Berthing Facility Feasibility Study spearheaded by the chamber of commerce looked to find a way to eliminate the need to tender passengers, and it focused on expansion at Cabrillo Mole to make it happen. The feasibility study offered three different scenarios at the mole that the chamber hoped would keep cruise lines interested in Avalon as a port of call for years to come. Griffin added that the view blockage a docked ship would create in this scenario probably makes the option a “non-starter.” “Our community understands the importance of maintaining and building the cruise ship business, but what they’re most concerned about it is the visual impact that tying a ship up might present,” Griffin said. Options 2 and 3 better address the view-blocking problem, situating the dock at a 90-degree angle with the mole, extending out toward the open ocean. The result of the dock position change would mean only the stern of a ship would be visible from shore, instead of the length of a cruise ship. While Option 2 would include the potential for two ships to dock simultaneously, Option 3 was the preferred choice listed in the study. It would include a floating dock system that would be used instead of standard pile-supported systems, and it would cause significantly less environmental impact in the area. At $14.1 million, the estimated cost of Option 3 is about half the $29 million estimated for either options 1 or 2. The system, called Seawalk, is a new technology incorporating a floating pier that can be retracted and stored during bad-weather periods. While the system has not yet been utilized, the company announced in January that Skjolden, Norway will be the first port in the world to use the system, and it should be operational by summer. Now, with Stickler’s proposal being introduced this month, a fourth choice has been added for the city to consider. “It kind of came out of nowhere, but we asked Jeff if he would like us to include his plan with the others when we run them by the regulators — and we included it as a fourth option,” Griffin said. Since 1974, Stickler has been running Island Enterprises Inc. at Catalina, providing tour bus rides, glass-bottom boat adventures and yellow submarine trips. In the 1980s, Stickler said he worked hard to get cruise lines to start utilizing Avalon as a berthing port, and he arranged an agreement to tender passengers to and from the ships. His new plan might make his current tendering business obsolete, but it could expand Avalon’s visitor amenities greatly. Stickler’s proposal would move the cruise ship zone out of Avalon Harbor’s view corridor, east of Lover’s Cove Marine Preserve. Stickler took the cruise ship proposal opportunity to bring back to life a long-talked-about plan to develop a commercial airstrip for Avalon, capable of handling regional aircraft. His plan calls for filling in the shallow water area along the Pebbly Beach Road shoreline from Ring Rock eastward to the Edison Plant, where a 4,500-foot-long runway would be constructed alongside a docking area capable of berthing up to three cruise ships at a time. “I don’t want to see too many cruise ships here, but more ships would really give Avalon a boost,” Stickler said. Terracing of the hillside above Pebbly Beach Road would be required, and that could help curtail rock slides that commonly occur and have resulted in closures along stretches of the road. 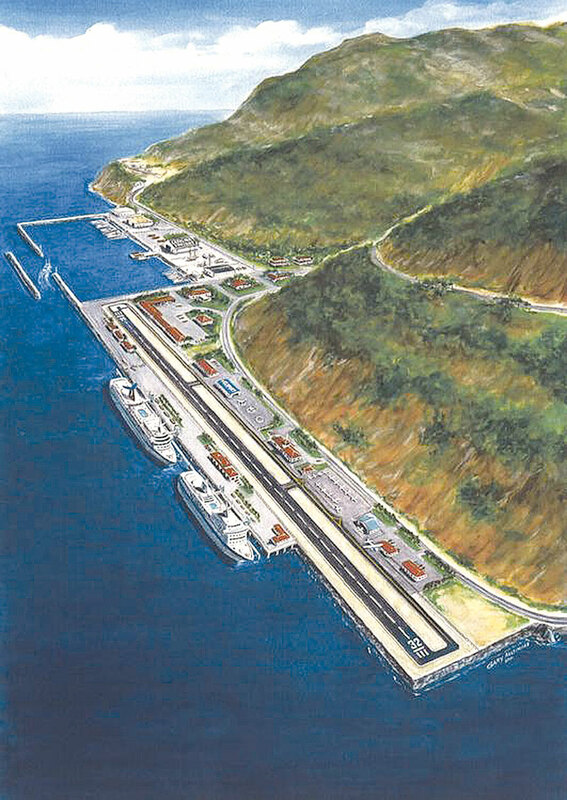 In addition, a small marina would be built as part of the landfill seaward of the Catalina Freight Lines terminal and the Edison Plant. The marina would provide space for a new fuel dock, a shipyard and other marina services on a year-round basis; and it would provide protection for barges to unload in rough weather. While the cost of the project would be significantly higher than the chamber’s proposals at Cabrillo Mole, Stickler noted that the airport, marina and additional cruise ship capabilities could produce more funding opportunities from agencies such as the Federal Aviation Administration, the California Department of Boating and Waterways and higher-end cruise line companies. According to Griffin, the four options will be taken by consultants, who will present the options before state agency representatives at the California Coastal Commission and the California Department of Fish and Game, to see if the plans are viable. Ports & Maritime Group International, MAC Maritime Inc. and URS Corp. teamed up to create the original three options presented by the chamber to city council members. The feedback from the agencies, which is expected to come within the next few months, will determine which options the city will study, moving forward. Ship pier parallel to wave set? What could possibly go wrong? Can’t these people remember the last pier they built for the SS Catalina parallel to the wave sets. That white elephant is still sitting there in plane sight and apparently they can’t see it.